Brian: Well, what are a few keys that a LCO needs to know and recognize in order to market their company successfully online? Andrew: Sure, there are a number of different things. I have a couple big ones, would really be to develop a solid step-by-step game plan before you start. Before you do anything, you really need to have a clear direction of what you want to do online. You need to know what your goals are of any marketing campaign that you run, whether that’s an off-line campaign or an online campaign. You should have a goal in mind of what you want to achieve, of what you consider would be a successful campaign, a successful return on investment. If you don’t have that, you’re generally going to spin your wheels. Not really have a clear direction. Waste a lot of time and money and not have much to show for it at the end of the day. The main way that you can do that is really to educate yourself in what online marketing is. The different things, different strategies that you can take. Different things that you can accomplish, with online marketing. Just watch it also, that you make an educated decision. If you want to hire somebody to do it for you, you need to understand what they’re going to be doing for you. How it works, and have a realistic idea of what results you can expect. If you’re going to hire somebody for you, to do it for you, you really need to research them. You need to know if they’re going to use any black hack or shady marketing techniques that might get you temporary results but ultimately they can really get you banned. Brian: Where could you find someone, if an LCO wanted to hire somebody, where would you look for that person? Do you look for a marketing background? Do you look for someone who knows the industry? What would you recommend? Andrew: If they’re trying to hire a specific individual? Brian: Yeah, internally, who they want to handle their online marketing. Andrew: Well, if they want to do everything internally, and they’re looking just to hire one person, they’re really going to have to find a very unique marketing ninja, is what I call them. They’re going to be very expensive. They’re going to be well over 60 grand a year. They’re going to have to have a programming background. They’re going to have to have a design background. They’re going to have to have a really full understanding of pay-per-click. Ad Words is an incredibly deep product, if you’re familiar with that. That’s the Google pay-per-click program that lets you run ads on the Google search engine. That’s a very deep product. They’re going to have to have an understanding of that. They’re also going to have to understand social media. So, even if they understand all of these different techniques, there’s a strategy behind all of them. Even though they might be able to program, or they might be able to put up a web page, it might not necessarily be a web page or a website that converts or gets you new clients. They need to be a specialist in each of these individual fields. So, hiring just one person for your company is going to be pretty tricky. So what I generally recommend for a company that is wanting to do everything in-house would be to first look at what options you have outside of your own company. I would look at hiring a company that’s a specialist, not just in your industry, but in local, local search marketing because that’s ultimately what you need to target, is clients in your service area, obviously. So, you really need to find an agency that could target that. That’s the place I would start. Because what you’re going to find is an agency is going to have specialists in all these different areas. That is going to be very difficult to replicate with one person or an in-house team. If you try to do it all in-house, chances are you’re going to be spending a lot more than you’d be paying an agency to do it for you each year. So, that’s something that I would keep in mind. That’s really not even going to be a practical option at all, for especially smaller LCOs and landscaping companies. It is a very technical field and just because somebody has a computer or Photoshop or Dreamweaver and they can set up a web page, that doesn’t make them a marketing expert. That doesn’t make them a guru in pay-per-click. In the same way that if you buy a paintbrush, that doesn’t make you an artist. So, you really need to have some education, what online marketing is, what results you can realistically get, and then do your research. Check out a number of different marketing companies. Do some research in them. And, really grill them and find out what they can offer, and what they can truly deliver. Brian: It’s also a better avenue for the business owner or maybe, someone within the company to become educated on it and sort of add it on as a task. Andrew: Yes, yes. It’s going to be difficult to just pick up a SEO for dummies, a search engine optimization book for dummies and teach yourself everything you need to know to implement a really successful optimization campaign. It’s rare, the companies that we work with, it’s rare that they have the time or resources internally to put somebody on it that’s really going to be able to perform at the level that they need to be in order to compete with other people in their marketplace. It’s just not a task that you’re going to pick up in six months and be a master at it, but when you are a small company, when you don’t have a lot of resources, you have to start somewhere, and that’s another great part point is that, you do need to start somewhere. We get a lot of clients who, they’ll call us. They’ll call us one year, and then we won’t hear from them for another 12 months, and we ask them what they’ve been doing for 12 months in their marketing. They’ll tell us, “Well, we haven’t really done anything. We’ve been debating whether or not to hire somebody to do it internally, but instead we ended up not really doing anything except maybe, lifting our business in City Search or paying Service Magic or something for some leads.” And that’s really just a big mistake because if you think about it, that company has probably lost out on probably, at least, 300 potential leads over that year. Even if they’re in a small market, 300 leads is realistic. If they’re in a bigger market, it’s much more than that. It’s in the thousands. So, that’s a lot of money to overlook. And that’s money that they overlooked by sitting on their hands and not taking any action or not doing research and not starting somewhere. So inaction is really a killer. Brian: So, where does social media come into play with this? Is online marketing and social media one and the same, or are they different avenues because I think a lot of LCOs might see social media as a freeway of online marketing. Andrew: Social media is the thing that gets all the publicity, and it really has a lot of hype surrounding it, right now. So, that is oftentimes what people think of when they hear the word online marketing, but online marketing can encompass a number of different things, a number of different strategies. In social media, really, the way that people should really look at it, is that social media is really just a tool, just like putting up a website or running a pay-per-click campaign, or SEO, or email marketing. These are all different tools in a marketing toolbox. When you’re developing a game plan, a marketing game plan, you’re going to want to take the best tool to accomplish whatever goal that you’ve decided you want to accomplish. Your goal might be to get as many leads as possible. And in that case, you’d want to implement an SEO campaign that’s combined with PPC, and maybe some direct mail, and some door hangers, and some offline strategies, as well. You might mix and match a number of different tools from that toolbox. If your goal is to increase your customer lifetime value through up selling, and promotional services, and seasonal services, getting your clients to buy more, then you might want to do a combination of email marketing and social media. You’ll just choose different tools for the job. So, all of those different tools fall under the online marketing banner, whether it’s SEO, PPC, whatever, and you want to pick the best one for the job. It’s just like building a house. If you’re building a house, you’re not just going to use a hammer. You’re going to use a saw, you’re going to use a ruler, you’re going to use a number of different things, and you’re going to combine them all to build that house as quickly and as efficiently as possible and to yield the most profit. Which in this case would be the biggest return on your marketing investment. Brian: Well, how long would you say a company would need to really put an effective online marketing plan in place? Andrew: To implement the different strategies? Andrew: Well, it’s really going to depend on how deep they want to go. The way that we approach it, we always have a very in-depth, long conversation strategy meeting with our new clients. We determine what their budget is, what their goals are. And then, we’ll lay on the table what we think is going to be the best approach to take. Typically, if they’re going to do SEO, you’re generally going to see results within two to three months. Your rankings are going to start to change. Any company that’s going to guarantee a first page ranking in a week or in a month, or guarantee you a ranking at all, they’re a company that you need to be very wary of because they don’t control Google. Google’s algorithm changes every 17.5 hours so you should be wary of companies like that. So, for SEO generally you’re seeing results within two to three months, and like I said, it’s a long-term strategy, so your rankings are just going to continue to rise as long as you’re in that program. They’re going to be doing monthly link building. They’re going to be developing new content for your site, keeping it fresh. They’re going to be getting additional traffic to your site through pay-per-click campaigns, through email marketing, through social media. It’s really going to depend on the client’s budget. How big they are, and what works right for them. Like I mentioned earlier, we’re unique in that we don’t just work with companies that are a million plus dollars. We’ll take on the smaller guys, so long as we think that they are committed to their business, growing their business, and they’re as hungry and as dedicated as we are. Brian: All right, Andrew. Thanks a lot. There’s a lot of good information there. 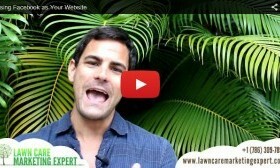 I want to remind everyone again, the website is LawnCareMarketingExpert.com and, Andrew, thanks a lot for your time. Andrew: My pleasure. Thank you, Brian. ‹ What Records Are You Going to Break With Your Lawn Care Business Over the Next 12 Months?